Community policing is viewed as an important concept and one that is necessary to build positive relations between law enforcement and the community served, yet, it continues to be difficult to define. While there are many definitions of community policing, one that is widely accepted is Trojanowicz and Carter’s, taken from their 1988 article published in The National Center For Community Policing titled, “The Philosophy and Role of Community Policing”, which defines community policing as “a philosophy not a specific tactic”. They elaborate further by describing community policing as “a proactive, decentralized approach, designed to reduce crime, disorder and by extension, fear of crime by, intensely involving the same officer in a community on a long term basis so that residents will develop trust to cooperate with the police”. Philosophy is the key word as community policing must meet the fundamental values in creating partnerships with the community. Community policing, as a philosophy, must begin with an effective community policing training program. The creation of Community Policing Divisions within police departments can be effective. However, in order to make it successful, the entire department must subscribe the community policing philosophy. This concept must be instilled in the foundation of an officer’s training at the police academy. Although this can be accomplished through an effective community policing training module, the community policing philosophy should be incorporated into all police academy models which focus on cognitive training. 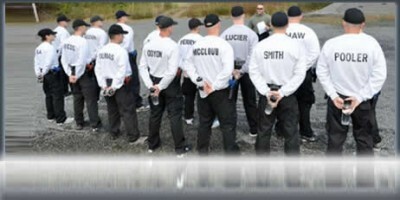 When examining various training programs, Robin Haar, in an article published in Police Quarterly, titled “The Making of a Community Policing Officer”, found that concepts based on problem-solving techniques, dealing with special populations, how to build police-community relations, team building and leadership, communication skills and tactics, and patrol techniques are all courses that must be covered in the basic recruit academy in order for recruits to build knowledge, skills, and abilities (KSA) associated with the community policing philosophy. Community policing training is important at the recruit level because without it, officers are less likely to understand the community policing philosophy and how to transfer the philosophy into the field, as noted in King and Lab’s article titled, “Crime Prevention, Community Policing, and Training: Old Wine in New Bottles” published in Police Practice and Research. Community policing stresses the importance of building positive relationships built on trust with members of the community. For community policing to be effective, police must ensure the support and approval from the public. The community, as a stakeholder, has a direct interest that officers possess the basic KSA to create a partnership with the citizens they serve. Officers serving in a municipality are a direct reflection of the police department. If officers are incompetent, the entire department will be affected and viewed negatively by the public. The community policing philosophy, at its core, is about the community having say in the way they are policed. Recruit officers must intend to transfer what they learned in the training into the field upon completion of the program. In addition, when managing a community policing training program, it is important to not only measure the outcome of the program; but also, the training program itself needs to be measured to ensure proper delivery of the subject matter. Measuring the way the material is taught is vital for quality improvements to the program. This can only develop from a well-managed training program which follows the most up to date literature on effective training methods. Because learning styles are always changing, often due to generational differences, training programs must always be evolving. To know if a program is working, not working or needs improvement, measurements must be conducted. The research must use empirical evidence which can provide essential information and feedback regarding the recruit’s outcomes and can lead to improvements of the program. Overall, this can determine the worth or value of the program. An effective training program is paramount to ensure the academies are turning out capable officers. Lastly, the individual officer is not free of accountability. As seen most recently in the media, an officer’s actions are greatly scrutinized and criticized by the media and public and have led to several officers’ resignations even though criminal and/or civil responsibility went unfounded. It is incumbent upon the individual officer to gain proper KSA which will result in proper action when split-second decisions occur. If officers have proper and effective training, it will at least create a solid foundation for them fall back on with the hope to avoid high-risk situations.